Chicken Croquettes is very crispy dish. 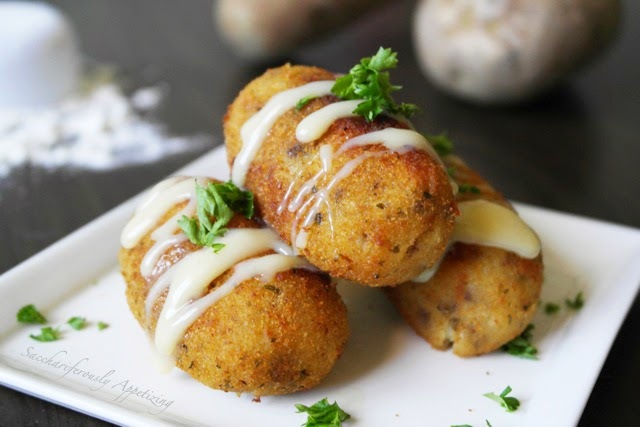 Here some different recipe to made this crispy Chicken Croquettes. You can serve it as a breakfast. It completely fulfill you appetizer. Its very easy to make, you can make it within 20 minutes and preparation time is 5 minutes. Put chicken and oil in a dish. Mix well. Microwave covered for 4 minutes. Shred chicken to tiny pieces. Discard bones. Mix batter, onion, chillies, and maida in a dish. Microwave for 1 minutes. Add milk, mix and microwave uncovered for 1 minute. Add all the other ingredients. Mix well and shape into rolls. Dip the rolls in egg mixture and roll over maida. Grease a non stick tawa with oil. Place the rolls on it. Pour some oil on the rolls. Place the tawa on high rack and grill for 10 minutes. Change side and grill 4 minutes till the roll turn golden. Serve topped with some mayonnaise. You can also make a balls or kebabs with this mixture. Add some corns or peas for different flavor.